Acetogenin-containing concentrate from the extract of leaves of the South American soursop tree (Annona muricata). Has revitalising effects in older animals. Acts against spasms, has a calming effect during stress, assists in reducing blood sugar, lowers blood pressure. Strengthens the heart and immune system. Also has antibacterial effects and manifests antiparasitic effects against unicellular blood parasites. Has pronounced selective cytotoxic effects. Acts on certain types of tumours, while posing no danger to the cells of the body. Add-on product in cancer treatment. Selectively destroys the cells of certain tumours. 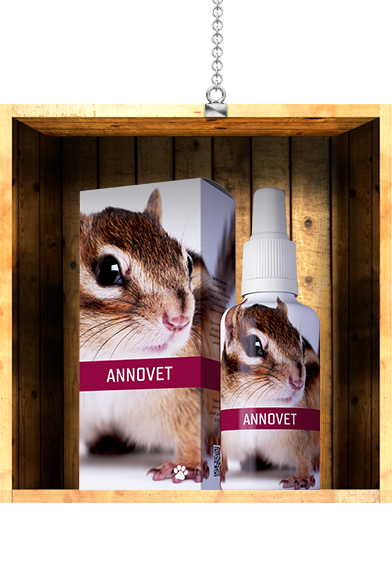 Increases vitality and zest for life in old animals or animals with severe diseases. Has a healing effect and increases the resistance of mucous membranes even in cases of infectious disease. May be used as an add-on product in the treatment of parasitic diseases, especially those caused by unicellular parasites. - Immune response to infections. - Nervousness, has calming effects. - Propagation of unicellular and multicellular parasites. - Growth of bacteria in the digestive tract. Concentrated herbal extract 90% (Annona muricata), cellulose - thickener, water, xanthan gum – thickener, citric acid – acidity regulator, potassium sorbate – preservative. For all animal species, administer 1-2 drops per 10 kg of animal 2-3 times a day. For large animals 5-10 drops per 100 kg 2 x daily. Do not exceed the recommended daily dose! Three weeks’ use is to be followed by one week’s rest. Ensure sufficient water intake during product use. Shake before use. When administered for longer than one month (including the week-long rest), probiotics should be applied. Administer separately from other regenerative products with a minimum interval of 10 minutes. Reduce the dosage if vomiting or unwanted sedative (calming) effects occur during administration. Lowers blood pressure. Cannot be used in cases of hypotension. Not suitable for pregnant females. May cause miscarriage. Cannot be used with medicines that lower blood pressure. Store in a dry place away from direct sunlight at a temperature of 10-25 °C. Do not freeze. Keep out of reach of children. We recommend using the product within 3 months of opening. Best before date on the packaging. Recommended as effective in the removal of intact mammary tumours. Partial results are also achieved in other types of tumours with anaerobic metabolism. Also acts on severe bacterial infections of the intestine resistant to antibiotics. Due to the antibacterial action, the subsequent administration of probiotics is necessary.